The death of Charles Krauthammer this week is like a giant sequoia falling in the forest of journalism. He didn’t need his Pulitzer title to elevate his standing – he was, to quote Fox News editor Brit Hume, ‘in a class of his own’. This was a man who grew up knowing how to learn Torah, became paralysed from the neck down in a diving accident but went on regardless to study medicine and psychiatry. His true vocation was as a syndicated columnist and political commentator and I tried to never miss his appearances on the panel of Fox News’ Special Report. 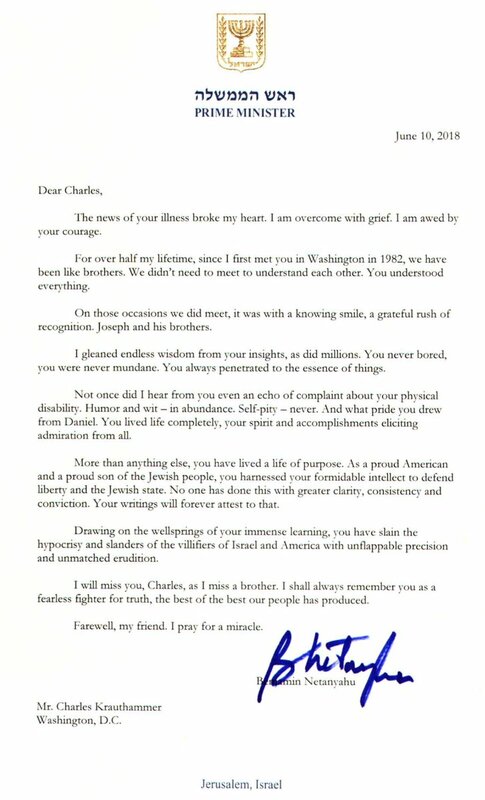 Above all, Charles was an outspoken and fearless defender of Israel and the imperative of a secure Jewish state. A few weeks ago he wrote a last dispatch to say he had mere weeks to live. In that message he said ‘it’s been a wonderful life’. How incredible to hear such a thing from a man confined to a wheelchair for 40 years and totally dependent on others. It should be an inspiration to all. 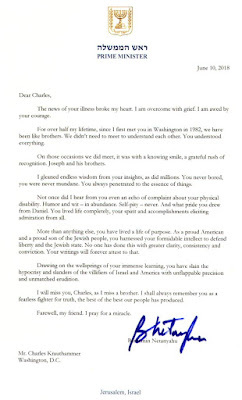 I am appending here Prime Minister Netanyahu’s letter to Charles after his final message was published. It is terribly sad that he became ill so shortly after Trump’s election. To be robbed of his piercing commentary during Trump’s first 500 days, with all the skulduggery of the Left and media bias, was like watching a symphony without the sound. Click the the life-story video presented by his Fox News host, Bret Baier. It is well worth watching the full hour.